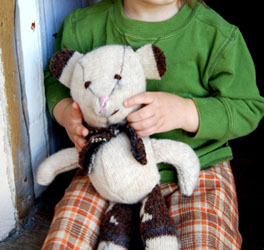 Use this free teddy bear pattern to sew an adorable recycled, felted wool sweater toy! This bear is ultra afforable to make too, head straight to the men's section (or plus-sized women's section) of your local thrift store to find large, 100% wool sweaters. The larger the sweater the more material of course! Solids or choose prints/stripes like I did to create a one of a kind sweater bear. First step is to felt your wool sweaters in a washing machine. Felted wool is very sturdy and doesn't unravel the way a non-felted sweater does. It must be 100% wool to work of course. I always pre-cut up my sweaters (remove arms, cut off all seams, etc until I have flat pieces of sweater fabric because they'll felt more evenly this way. Here are instructions for felting wool sweaters. 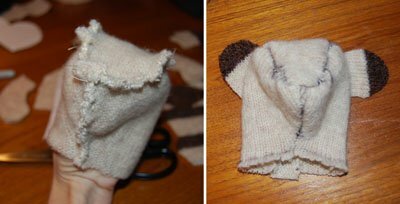 After felting your wool sweater, print out the free teddy bear pattern PDF for the head, arms and ears and the teddy bear pattern PDF for the legs and body. This is a template which means you'll need to add your own seam allowance. 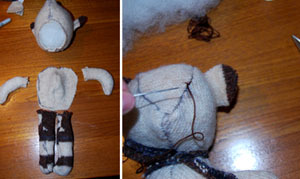 Sew up to the nose from the neck, leaving the rest unsewn to add in the top flap. After you've sewn the three head pieces together, turn right side out and sew on the ears. You can hand stitch these on top, or cut little slits in the fabric and pull through and sew. Don't worry about getting them exactly even, if they are a little crooked it will only add character and personality to your bear! After you've sewn all your individual parts, stuff and assemble. I personally hand-sew when I assemble because I tend to overstuff and find it easier than dealing with the sewing machine. Finally, embroider on eyes, a nose and a mouth and it comes to life! I also added a scarf out of some sweater scraps. Give it to a child who will love it and give it a proper name. My son named his "Toot Toot Bear" which seems perfect. 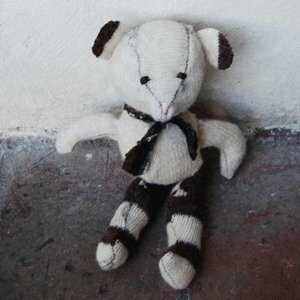 I hope you enjoy trying out this free teddy bear pattern! As with all my free patterns, they are free for you to use for your personal use only not for items for sale. Sweater Bear Pattern by MakeBabyStuff.com is licensed under a Creative Commons Attribution-Noncommercial-Share Alike 3.0 United States License. 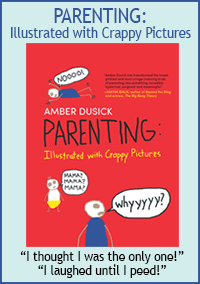 Permissions beyond the scope of this license may be available at http://www.make-baby-stuff.com/contact.html.